Follow in the footsteps of the early explorers and visit the Mackenzie Country to view one of New Zealand’s Alpine treasures. Witness the powerful forces of nature’s work in carving out the awe-inspiring peaks of the Southern Alps. The diverse and changing landscape from plains to mountains via the Inland Scenic Route is one of New Zealand’s top road journeys. Break the trip with a stop to taste popular local produce along the route (cheese, salmon & fruit are favourites in this area). Visit the picturesque Church of the Good Shepherd in scenic Lake Tekapo. This quaint little church is one of the most photographed landmarks in New Zealand. A soak in natural hot springs, a spa experience lakeside or trying your hand at ice skating are all optional inclusions here at the Alpine Springs Spa & Winter Park. In the World Heritage Area that includes Aoraki Mount Cook, New Zealand’s highest mountain, visitors can enjoy the alpine vistas, take a refreshing alpine walk or take to the skies to view the mountains and the Tasman Glacier from above. Glacial lake boat experiences are also available seasonally. A visit to Aoraki Mt Cook is ideally a minimum two-day round trip from Christchurch, or can be included in a limousine transfer from Christchurch to Queenstown (or vice versa). If you choose to overnight in Lake Tekapo or Aoraki Mt. 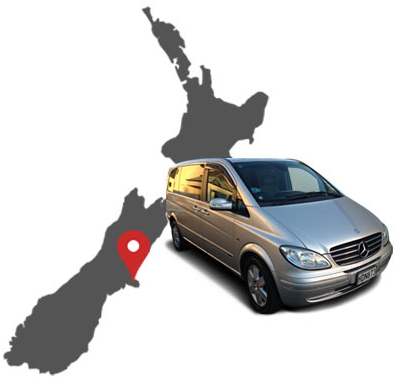 Cook region we wil happily recommend suitable accommodation and local attractions to complete your experience. Tours will be tailored to your interests and timeframes.